Ham radio has become an increasingly popular tool for preppers and people living off the grid. While it is a fairly inexpensive hobby to get into (you can buy surprisingly good imported handheld radios for under $30) there are a few things you need to know before you purchase a ham radio. Sure, you could just stash a radio for emergency use, but will you know how to work it properly? Will you be familiar with the communication nets and procedures in your area? Pretending you’ll only use a radio in a vague and ill-defined “real emergency” is like carrying a pistol and not knowing how to use it, figuring you’ll only fire it when you have to, and then not knowing how to turn off the safety. Licensing is more than just being able to legally operate the radio in normal times; it gives you a foundation of knowledge to work from so you know how to operate on the air, how to communicate with others, and what is going on in the world of amateur radio. Unlicensed operators tend to get ignored really fast by other ham radio operators, and the FCC has been known to track them down and issue fines. Really, if you want to get on the air without a license, there are plenty of options. If you want to use amateur radio, the time and trouble to get a license is negligible compared to the benefits you get. Plus books like this one or blog posts like this one make it easy to learn everything you need to get on the air. There are three license classes, with increasingly difficult tests. To access local repeaters, and use the common 2 meter band, a simple Technician class license is sufficient. To access all HF (High Frequency) bands, a General class license is needed, and an Extra class unlocks all portions of all amateur frequencies. For the casual user, a Technician or General is all you really need. Amateur radio provides a decentralized communication system that is highly robust and readily scalable in the event of an emergency. Because each operator runs their own station and can easily operate off the grid, it is very difficult for communication to be fully knocked out. Most areas already have formal emergency nets with volunteer operators ready to aid in emergency communication and relay messages when needed. In addition, having a ham radio is a great way to communicate in normal circumstances as well, especially if you live in an isolated region–it’s even possible to send and receive email over ham radio! There are many radios, ranging from the inexpensive and useful Baofengs to expensive multiband base stations. The radio you select will depend on your budget and needs. A small handheld will work fine for local use and hitting close repeaters, but you may want a 2 meter base station for longer range work. For HF work, you’ll need a more expensive setup, but the average person looking to communicate in an emergency likely will not need more than a good 2 meter setup. When in doubt, find a local radio club and talk to some experts about what kind of setup can work for you. While amateur radio is very useful for emergency and off the grid communications and has proven its worth for over a century, there are real drawbacks. For many, getting licensed to use a radio feels like a betrayal of natural rights, and it is logical to resent this intrusion into personal affairs. Operating a licensed radio may not be ideal in that case, but there are plenty of other radios, including CB, that would have sufficient reach off the grid or in an emergency. It can be an expensive hobby to take part in, too. Right now, I am running a Baofeng as my only radio (hey, I’m cheap, and I have other expensive hobbies), but in the past I’ve had thousands of dollars worth of gear. But even the cheap handheld required an antenna upgrade, spare battery pack, and a programming cable which pushed the price up. I still kept it well under $100, but even entry level isn’t as simple as it seems. 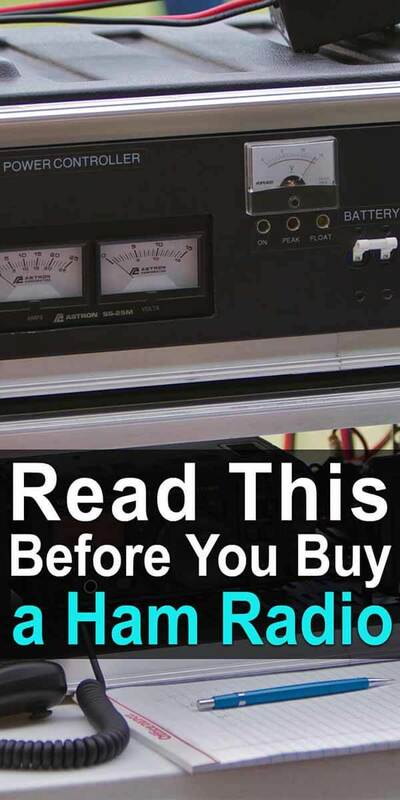 One can readily find themselves spending thousands of dollars for an all band radio, antenna or antennas, antenna tuner, amplifier, etc… You are literally operating a radio station, and that can come with a steep price tag. And perhaps the biggest drawback to some is that your communications aren’t private. You can’t legally transmit encrypted or obfuscated messages–everything you send is in the clear, and you can even be triangulated from your transmissions. This might be fine for most people, but you really don’t want to say something you wouldn’t want lots of other people hearing. As a tool for communicating off the grid, in an emergency or as a rewarding hobby, there is a lot to be said for ham radio. It is often the backbone for communications when traditional networks go down. It allows people in remote areas to readily communicate, and it is useful as a regular radio communication tool as well. There are many different modes, including digital packet and television which can be sent over amateur radio, making it a very versatile tool. There are drawbacks including equipment cost, licensing, and communications security which can limit the value for some. Overall though, it is hard to argue against ham radio as a tool and a hobby for those who want an extra level of preparedness in their life, or who simply enjoy playing with electronics. Since there are many websites and other sources which would be readily available after SHTF on which anyone, literally anyone, including but not limited to, any local, state, federal government official, including every alphabet agency and your local police and neighbors can easily find your name and address, as in your location, from your call sign, many hams are now spending a minimum amount to get a PO Box and registering their call sign, or changing their registration to, this PO Box. Only have your FCC and other related mail go to this. This keeps your location private from individuals and groups who you do not want to find you. This article (and most comments) are pretentious as hell. You can listen to all of it as much as you want as long as you aren’t transmitting without a license. Armchair elitists are killing this hobby and have been for years. Trying to scare people away with your boogyman “you’re garbage and shouldn’t own one if you don’t have a license” comments repel people who are interested in joining the Ham world. You’re not Elmers, you’re a-holes. Get a license. When the FCC deregulated citizen band so no license was needed it went to pot. Nothing there now but cursing, threats, illegal amplifiers that splatter all over the band. Come on. In a SHTF situation or mass casualty event, you really think the feds are going to have the time and manpower to enforce your lack of license? Oh excuse me but you dont have a license to call for help, are these 16 dead people laying on the ground your family? see you in court oh watch out for the lava on your way out. geez. I agree they won’t have time to enforce your lack of license after a disaster. But you need to practice using a ham radio before a disaster, when they will have time. Late comment, I know. But for those that come across this I want to point out something. If you are talking about a 2 meter repeater and a baofeng, using one won’t take much experience, however if you are out of range from a repeater and have to use HF, things are completely different. Unlike a cellphone or 2 meter rig, it takes a lot of experience to get two way reliable and repeatable communications going. Just having an antenna 2” too short or long can make a major difference. The right length at the wrong height makes a difference too. Heck, I have to readjust my antenna tuner settings whenever I move a cable. Of course it’s all up to you, but keep in mind that HAM Radio is not plugging play. Your SHTF situation may not be happening in everyone’s area, and beyond the immediate call for life saving help, most people won’t endanger their license to talk to you. So when you are trying make contact to people outside your area to perhaps tell family what has happened, no license, no reply. Given the circumstances of my most likely SHTF scenario, I will stick with my Baofeng radios. I have 32 pre-programmed channels that span the UHF/VHF spectrum and use supplemental Nagoya 144/430 MHZ dual band antennas for increased range.